"Why do international celebrities seek me out? Because they've fallen for the beautiful heart hanbok represents." 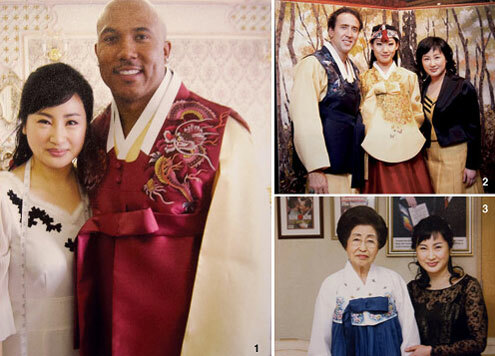 The late actor Anthony Quinn, Hillary Clinton and football star Hines Ward have all worn traditional Korean costume designed by Kim Ye-jin (44). Other celebrity clients include UN Secretary General Ban Ki-moon and actress Choi Ji-woo. She finds making hanbok is the most fun activity in the world. "When friends call me when I'm at work, I tell them that I'm at the playground, and I call meetings with clients dates," she says. Kim constantly seeks new excitement in everyday life: that is also where she finds new ideas for her hanbok creations. "I try to incorporate ideas such as from the color of the food we eat like rice, onions and herbs. I combine and harmonize such colort for hanbok and scrutinize the client's body type to accentuate the strengths and beautify weaknesses. For instance, a longer collar will complement a round face and a shorter collar will suit a long face." Her dream is that people worldwide will see hanbok as an item of clothing they would like to own at least once in life. "The Japanese have the same idea about their kimono. I want to promote the beauty of hanbok to the world, and through it the world will also get to know Korea better," she says. Kim is not greatly enamored of current adapted versions of hanbok, which she says miss the true essence, which lie in retaining the traditional lines. While the personality of the designer should of course be reflected in the clothes, for instance in her own trademark fancy design, she stresses the fundamental identity of hanbok "must be maintained." Her pride, and obstinacy, when it comes to hanbok making is well known, but that is what has made her into an acclaimed designer. This is why without much marketing, both Korean and foreign celebrities seek out her designs. To hone her skills, Kim has attended every hanbok-related course there is, from natural dying to illustration. Her reputation mattered little when it came to self improvement: she took classes alongside young college students and was taught by famous academics, always eager to learn. Kim was born in Gwangju, Gyeonggi Province as the second of three daughters and a son. "I take after my mother, a skilled seamstress. I always woke up in the morning to the sound of the sewing machine and fell asleep watching the back of my mom sewing away the night. She was also good at making hanbok." Kim has design blood running in the family. Her older sister also used to design hanbok and her younger sister is a noted fashion designer. "I used to travel around the world with my younger sister. One time I saw a kimono displayed with other top luxury brands in a famous department store in the U.K. That's when I decided to become a hanbok designer. I said to my sister, 'I'll make hanbok and you do fashion design. We'll both become famous and then we can merge our areas to launch an international brand.'" The 20-year-old promise came true in 2002, when the two sisters launched the brand Boonique in Paris. Her goal now is to nurture Boonique into an international brand. "It only took 15 years for Versace to become globally famous. A Versace design spreads throughout the world through the hands of top notch publicists and distributors. To rise to that level, we will have to stake more on our designs and meet the perfect PR and distribution experts, so the day may come when our brand enjoys global recognition."